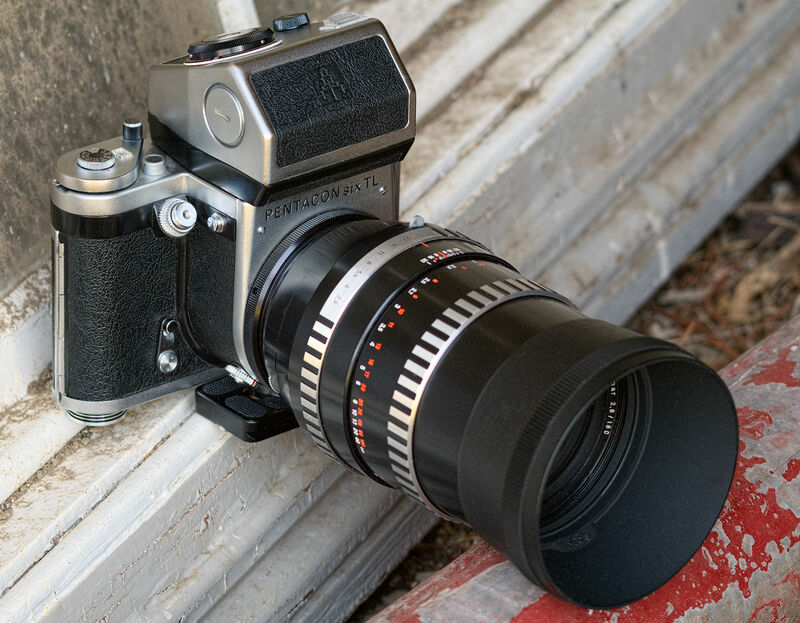 So hopefully completing the gear purchases, today, after hassling with two "rebuilt" (by Hartblei and by ARAX, both in Ukraine), I relented when the same guy who recently sold me a mint, as-new 1980's Carl Zeiss Jena 2,8/180 lens for P6 mount advertised a similar condition Pentacon Six TL body on eBay. Given that the lens arrived in about 10 days from Leipzig to Tasmania instead of the usual 4-6 weeks, and that the condition was exactly as described (unlike everything else people have sold me on eBay in the film camera department), I hit the Buy button as soon as it was advertised (things being helped by the price being once again about half of what other similarly described cameras were being sold for). OK, so the Pentacon metering prism turns tha camera from a pleasant Art Deco-inspired body into arguably the ugliest camera I've ever owned (and with three Kiev-60's in the stable that's really saying something), this meter actually works in three modes - Aperture, shutter and wide-open, and looks as new as the camera looks. The camera has also been serviced (it's impossible to hide the slight marks that are inevitably made on the labels on the winder and shutter speed dial when that happens, so the vendor wasn't fibbing) and the camera works perfectly... other than I haven't tried a film through it yet, so hopefully the frame spacing is perfect as claimed, and that I might finally have scored a camera in perfectly usable condition with those six magnificent Zeiss and KMZ lenses I have already acquired. Hopefully, like that 2,8/180 lens, it will have been worth the wait, and maybe even the two dead cameras and two working but with faults cameras I have thus far been saddled with by dodgy eBay sellers. This, then, hopoefully completes my return to film photography alongside my Fuji X and Sigma sd Q-H equipment. As a footnote - I bet no-one suspected that the lens I used on the Fuji X-T2 to take this shot was the pictured lens' smaller cousin, a P6 CZJ 2,8/120 of roughly a decade later manufacture. I am so sold on these lenses for B&W work (where their propensity for somewhat severe CA doesn't matter so much and which can be instead utilised as a free soft-focus filter at wider apertures) that I thought I'd try it for this shot. As can be seen, it's no slouch for colour, either. Looking forward to seeing what you can do with them, Alan.